Speaking by phone after visiting Yemen, the agency’s regional director, Geert Cappelaere, said he had never seen a cholera outbreak of that size in the country, which already is contending with the risk of a famine and a collapse of the health care system because of the war. 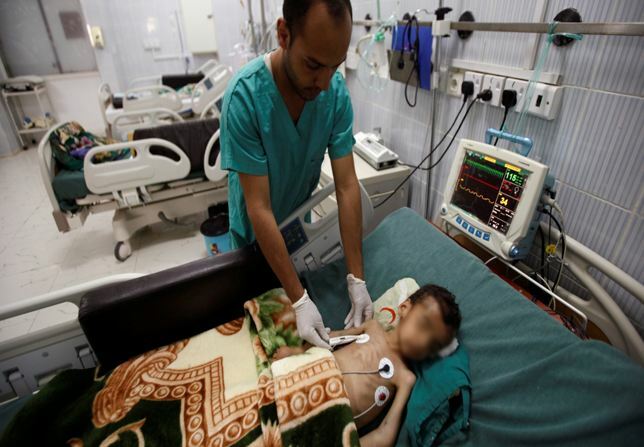 Half the cholera cases in Yemen belong to children, Mr. Cappelaere said, and parents have little recourse because many hospitals and clinics are closed or lack supplies. Mr. Cappelaere, who was named Unicef’s director for the Middle East and North Africa last year, worked for the agency in Yemen from 2009 to 2012. This was his first trip since then back to the country, poorest in the Arab world. Cholera, a bacterial disease spread by water contaminated with human waste, causes potentially fatal dehydration if left untreated. It has been expanding at an alarming rate in Yemen for the past month, from a few thousand cases to roughly 70,000. Most areas of the country are affected, Mr. Cappelaere said. Unicef, also known as the United Nations Children’s Fund, has provided clean water to roughly one million people, rehydration kits and other medicine to help fight the outbreak. Like other aid groups, it has implored combatants in the conflict to pause so that more can be done. Mr. Cappelaere said Unicef was calculating that without significant intervention, “within a few weeks’ time” the number of Yemen cases could reach 250,000 to 300,000. “Cholera doesn’t need a permit to cross a checkpoint or a border, nor does it differentiate between areas of political control,” he said in a statement released by Unicef about his visit.